The season started with great expectations by players andfans alike. Why not? You see I recall one of Coach Jack Roberts' few defining speeches of some years earlier. In it, his main point was simply that the basketball program existed for one reason only. The freshman and junior varsity served one purpose to assist the varsity to win. 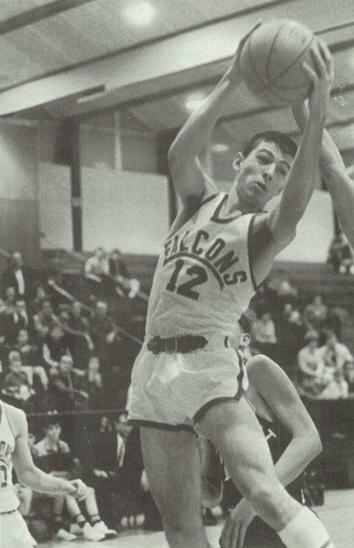 Therefore, we varsity Falcons had been pointing toward the 1965-1966 season for a long time. No one anticipated the adversity ahead of us. Early into the season the team was performing very well. By the third game, the fans no longer chanted something about winning the game. No, it was, "Glendale Falcons let's go state!" I liked the sound of it. In sports as in life, one can never know what obstacles are going to be presented. Coach Jack Roberts suffered a personal tragedy. His daughter was in a vehicular accident. She was hospitalized for a long time. Randy Magers, Marty Davis, and I visited the hospital to express our sorrow and best wishes to Mr. Roberts. I think he missed about 40% or so of the season. Coach Ed Baker stepped into the gap and coached extremely well. He had a great feel for making tactical decisions during a game. Steve Bean suffered a severe ankle sprain that kept him out for weeks. Bill Ed Davis, the tallest player, injured his leg with an undiagnosed hair line fracture. He gamely practiced with growing pain until he could no longer continue. These were not insignificant obstacles. However, the team persevered. This was the third Glendale basketball season. You may take this as old school if you like. First, Glendale Falcon basketball players do not give up. We went into every game assuming the win. It did not matter if the competition was the defending state champion or a lesser opponent. Championship teams learn how to win. We always thought that we would find a way to win. Second, our physical condition was 95% of the time better than the other team's. This resulted in our team looking like a second half team as we would pull away to go ahead in the last quarter. Though I assure you we were putting forth just as much effort in the first half. Lastly, the team was superbly coached and prepared for each individual opponent. The three point shot did not exist. The plays looked quite a bit different than today's. Coach Roberts had us learn six sets of plays. The set of plays to be run were determined by where on the court the center positioned himself. I'd say that three of the sets we learned were more theoretical and in practice meant to expand our understanding of the possibilities of the game. I say theoretical as they were never used in a game. The offense was guard oriented. There were three guards, point and wing, with two centers and no forwards. Opponents must have been very confused. The offense was primarily that of a very high degree of the way to score was to move without the ball. Roland Shultz and Steve Grant were the centers. They rotated in turn from the baseline to the top of the key or a point along the side of the key. Therefore, Roland or Steve were constantly showing to the ball to receive a pass. If they caught a pass, two guards would cross in from of them. He had the option of handing off, shooting, or passing back out to the third guard. If a guard dribbled toward another guard, that guard cleared out moving fast to the other side of the court. This all produced a great deal of movement without the ball. A fast player could outrun his defender to place himself in scoring or rebounding position. The team was totally unselfish. If a player was open, he got the ball. Defensively, we mostly played man to man. Further, we usually pressed man to man the full game. There were variations even here. In some games, only Coach Roberts knew why, we would play man to man with the variation of defense after a foul. If we were shooting a free throw the defense would be a full court zone press if the shot was made and fall back into a zone half court defense. If we missed the shot, we would play a man to man full court press and fall back into a man to man half court defense. By the way, the purpose of our press was not to steal the ball. It was to assist the other team into throwing the ball away. Once a Sedalia High School player asked me what we were running. I told him to figure it our for himself. In short, it was a thinking man's game. It took individual and team discipline of a high order to bring this off effectively. Several games before the regional tournament Coach Roberts rejoined the team. The Falcons cruised through the regional to advance to the Sweet 16 round. As a team we were peaking at the right time. We were looking forward to meeting the Class L State Champion runnerup Parkview High School. They were about a head taller at every position. Maybe because we believed in ourselves and our game plan we weren't intimidated. There was some time to get ready for this game. We practiced on a Saturday and Sunday to learn a new offense in that time. It was radically different. Randy, Marty, and I ran the same patterns of movement with and without the ball. However, the guard who passed off to another guard would set a screen for Roland Shultz or Steve Grant in the middle of the lane just in front of the basket. One of them would break over the screen to be hit with a pin point pass from a guard. He had an open shot. As an offensive player may only stay in the key for three seconds, this all had to be done with split second timing. The Vikings were completely surprised and reeling from being down at the half for the only time in the season. My family happened, out of the thousands in the stands, to be sitting with the Parkview players' parents. They had been talking about the hotel reservations they had made in St. Louis before the game began. At half time, they were silently looking grave. It was a low scoring intensively defensive game. Randy Magers was the best ball handler I have ever seen. Once I thought to help him bring the ball up the court. He waved me off in order that I should take myself and my defensive man out of his way. Marty Davis got his usual point total and played lights out by crashing the boards for rebounds at both ends of the court. Steve Bean came in late in the game to provide fresh legs and a couple of quick scores that gave us an emotional lift. I intercepted a pass out front between their guards. Knowing who was on my heels, I took it as fast as I could the length of the court and laid it up. My speed took me up a ramp out of the gym onto a second floor walkway. I didn't know the ball had gone in until checking the score board. Steve Grant performed his solid game of rebounds and error free play. Roland Shultz came to the attention of scouts as he was showcased in the game. Toward the end, the Vikings had a slight lead and used a stalling delay pattern which caused us to resort to fouling in order to send them to the line in hope of getting the ball back. The Falcons left everything on the court. Of such effort, traditions are born and built upon. After the state tournament was over, Parkview's coach was interviewed on the radio. Interviewer, "How did you feel the tournament went for you?" Parkview coach, "It went a lot better after we got out of Springfield."